On Friday 17th October Google launched a significant update to their search algorithm called Penguin 3.0; there have been two other updates all of which are aimed at targeting sites that have too many low quality links to them, and or too many links with commercial phrases in them. If you have been impacted by this update you will know about is as your traffic will have taken a big plunge that co-incides with the date above. The way to recover from this is to remove the poor quality or "toxic" links to your website and if you have been told of manual penalty then ask Google to reconsider your site. It's important to play by Google's rules which mean that you need to avoid collecting large numbers of low quality links and instead only build high quality ones. 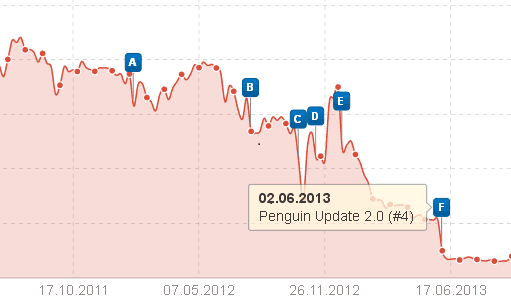 If you have been affected by these changes then contact us now, we offer a Google Penguin recovery service to help you get back to good standing with Google. We also offer ongoing Search Marketing that keeps you compliant for the future. Call our main number today on 020 3475 2777 and ask for the Search Marketing Team, or fill in our contact us form now. Google introduced its Panda Filter in Feb 2011, it is aimed at sites that have too much duplicate content or content of low quality, for example machine generated content. The updates was run periodically at first but is now run approximately monthly. 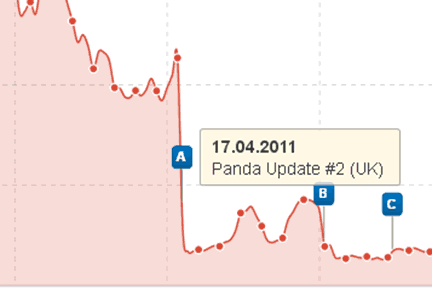 If your site has been hit by a dramatic drop in traffic that matches the you are suffering from a Panda issue. It may not be a direct result of anything you have done, as for example your site may have been copied without permission. Unfortunately you may suffer as a result of this. Or contacting third parties to get offending plagiarised content removed. We do all this for a one off consultancy fee, to learn more about this service, contact our Search Marketing Team today on 020 3475 2777 or use the form below to make an enquiry.